NEW ORLEANS – The collegiate indoor track & field season got off to a fast start this past weekend. Athletes, both fresh off standout cross country seasons and ready to get their seasons started otherwise, dazzled at meet across the nation. 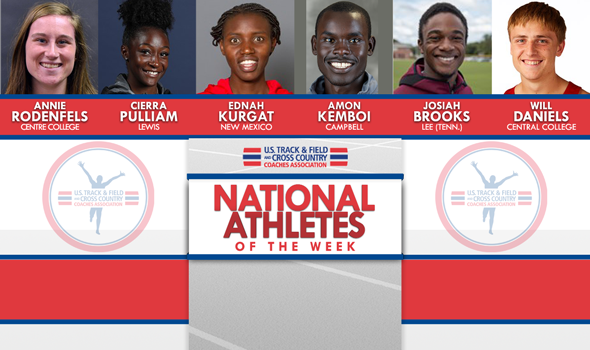 Here are six that stood out to the USTFCCCA Communications Department and were named National Athletes of the Week. Amon Kemboi set a PR in a big way this past weekend. Kemboi, running at the Sharon Colyer-Danville Season Opener hosted by Boston University, clocked a winning time of 13:33.64 in the 5000. That time was enough to give him a two-second win over Hoka NJNYTC professional Travis Mahoney. If you’re curious what Kemboi’s previous PR was, it’s 13:37.48, which he ran at the Mt. SAC Relays last April. Kemboi finished runner-up in that race. If he had run then what he ran today, he would have won by four seconds. Kembo is the first Campbell athlete to be named National Athlete of the Week during the indoor season. The Sharon Colyear-Danville Season Opener hosted by Boston University has turned into a premier meet for distance runners fresh off cross country to turn in a fast time early in the indoor season. That’s exactly what Ednah Kurgat did this past weekend. After finishing fifth at the NCAA Division I Cross Country Championships last month, Kurgat downright blistered the track in a winning effort in the 5000 and notched an all-time mark in the process. Kurgat crossed the finish line in 15:14.78, which stands as the third fastest time in collegiate indoor history. It was a loaded race as four women recorded all-time top-10 marks, ranging from Kurgat’s 15:14.78 to Boise State junior Allie Ostrander’s 15:16.38, which is now seventh on the chart. Kurgat is the first female athlete from New Mexico to be named National Athlete of the Week during the indoor season. Josiah Brooks turned in a massive weekend to kick of the 2019 campaign. Brooks picked up two wins and finished as the top collegiate in his other race as the senior competed in three events at the BSC Panther Indoor Icebreaker. The Athens, Georgia, native set two schools records in the 60 (6.76) and 200 (21.42), both of which were the best marks recorded at the NCAA DII level this week. He also added a win with a 15.19-meter showing in the triple jump which was also the best performance recorded in the division. On a grand scale, Brooks posted the second-best time the 200, fourth-best in the 60 and seventh-best in the triple jump across all collegiate levels. All three performances were NCAA provisional marks. Brooks is the first athlete from Lee (Tenn.) to be named National Athlete of the Week during the indoor season. Cierra Pulliam put up a strong performance across two events to take home a National Athlete of the Week honor. The Plainfield, Illinois, native recorded a 13.10-meter mark (42-11¾) in the triple jump and a 6.16-meter (20-2½) showing in the long jump to win both events at the St. Ambrose Frigid Bee. Both performances set school records and her mark in the triple jump was the seventh-best performance in NCAA DII history. Her long jump ranked her second in all collegiate divisions this week, while her triple jump was the best in the country. Both marks qualified the senior for indoor nationals. Pulliam is the first athlete from Lewis to be named National Athlete of the Week during the indoor season. Will Daniels picked up right where he left off last indoor season – and then some. Daniels, who won the heptathlon title at the 2018 NCAA Division III Indoor Track & Field Championships, recorded the third best score in the heptathlon in NCAA DIII history this past weekend. His seven-event total came out to 5423, which is 11 points shy of the six-year-old record held by Richard Roethel of Christopher Newport. Performances from Daniels were good enough to win three of the seven events and runner-up marks in two others. Daniels is the first athlete from Central College to be named National Athlete of the Week during the indoor season. Annie Rodenfels took a healthy crack at the NCAA Division III record book this past weekend. Rodenfels, competing as one of several NCAA DIII athletes in the 5000 at the Sharon Colyear-Danville Season Opener hosted by Boston University, won her heat in 16:44.40. That time was just three seconds outside of the all-time top-10 in NCAA DIII history – but did establish an incredible PR for the senior. Rodenfels had not gone sub-17 in the 5000 in her career until that point. This was a strong debut for Rodenfels, who finished third overall at the NCAA DIII Cross Country Championships last month. Rodenfels is the first athlete from Centre College to be named National Athlete of the Week during the indoor season.